NASA’s Juno spacecraft has entered the home stretch of its five-year journey to Jupiter. On Friday (May 27), Juno crossed a gravitational boundary between Jupiter and the sun, and the gas giant began pulling the spacecraft in ahead of a planned July 4 arrival, NASA officials said. "As of tomorrow [May 28], and for the rest of the mission, we project Jupiter's gravity will dominate as the trajectory-perturbing effects by other celestial bodies are reduced to insignificant roles," Juno project manager Rick Nybakken, of NASA's Jet Propulsion Laboratory in Pasadena, California, said in a statement. Juno launched in August 2011. Since then, three gravitational forces have markedly influenced the spacecraft's trek — those of the sun, the Earth and Jupiter. At the beginning stages of Juno's trip, Earth was most influential; more recently, the sun has had the biggest impact on the spacecraft's trajectory, NASA officials said. On July 4, the basketball-court-size Juno will fire its main engine for 35 minutes, changing the probe's velocity and allowing it to slide into an elliptical orbit around Jupiter. Once Juno is in orbit, the spacecraft will fly around Jupiter at least 37 times, coming within just 3,100 miles (5,000 kilometers) of the planet’s cloud tops during its closest approaches. Juno will study the gas giant's auroras and gather a variety of data that should shed light on Jupiter's formation, structure, atmosphere and magnetosphere, NASA officials have said. 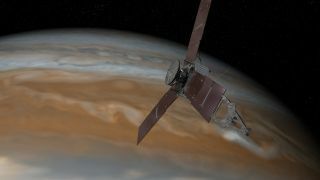 Science operations at Jupiter are scheduled to last for at least one year. Juno will be the second probe ever to orbit Jupiter, after NASA's Galileo spacecraft, which studied the gas giant up close from 1995 through 2003. Unlike the nuclear-powered Galileo, Juno uses solar energy and is equipped with the largest solar arrays ever flown on an interplanetary spacecraft. Each of Juno's three solar panels is 8.9 feet wide by 29 feet long (2.7 by 8.9 meters).